Spring has finally sprung in the Grand Valley! Mesa County Administrator Frank Whidden presented the State of the County report to the Mesa County Commissioners on Monday, March 25 during the Commissioner's administrative public hearing. The latest economic indicators presented in the address show an improvement in the local economy. 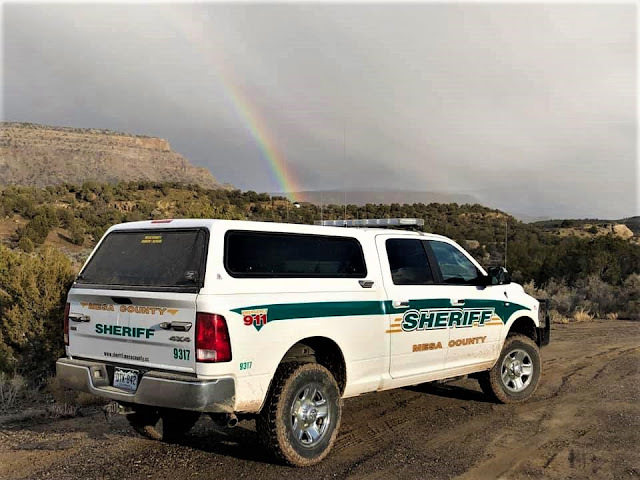 Mesa County government continues to provide needed services to residents while improving efficiencies in service delivery. Read more at https://bit.ly/2Fyk5t7. Mesa County Partners members Jill Derrieux, Paula Mattas and Jeff Roberts, gave the Board of County Commissioners an agency update. The mission of Mesa County Partners is to make a difference in the lives of young people by helping them develop a positive self-image, a sense of belonging, and acceptance of responsibility for their actions. Mesa County Partners presented their 2018 report in public hearing Monday morning. Watch the presentation at https://bit.ly/2FL5Od0. Mesa County Commissioner John Justman talks to KKCO News Reporter Jason Burger about the letter the commission wrote opposing the "Red Flag" bill. Watch the interview at https://bit.ly/2I0cYvt. 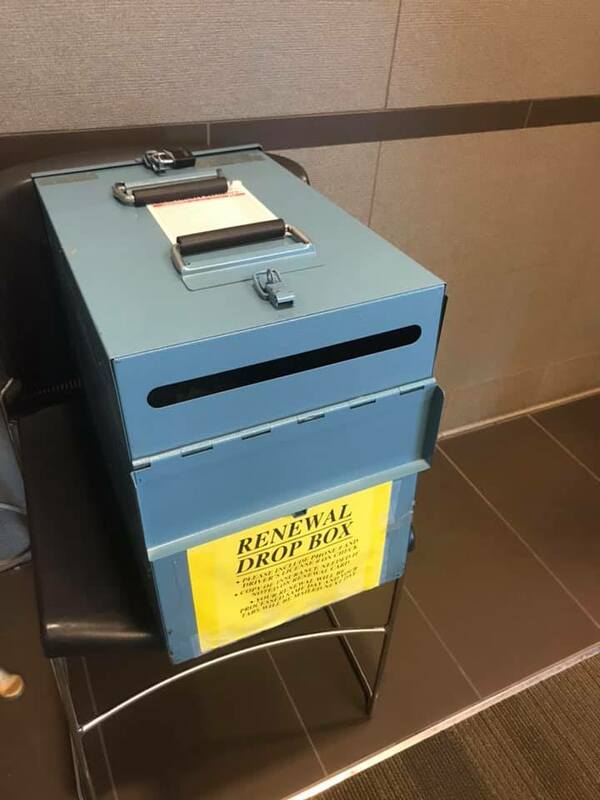 As promised by Mesa County Treasurer Sheila Reiner, a new after-hours drop box for tax payments is now available outside the 6th Street entrance of the old Mesa County Courthouse, 544 Rood Ave. 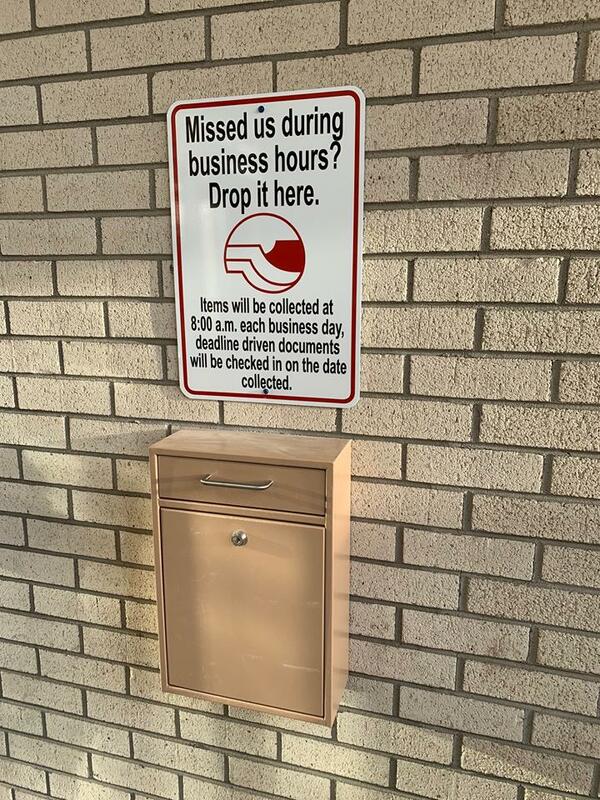 If you miss them during business hours, you can just drop it off in this secure box! 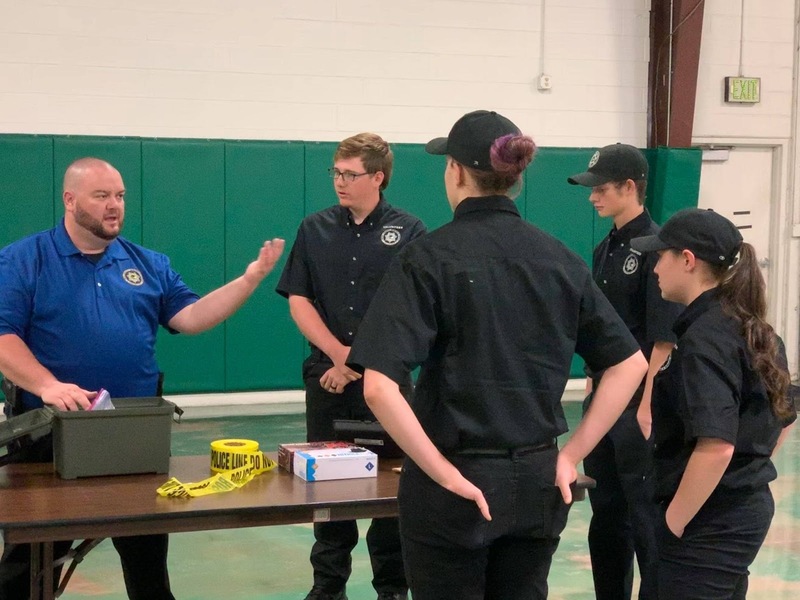 Mesa County Sheriff's Office Deputy Darin Huisjen teaches youth what it is like to be a cop as part of the MCSO's Youth Explorer Program. Learn more about the program at https://bit.ly/2WDMoMP. 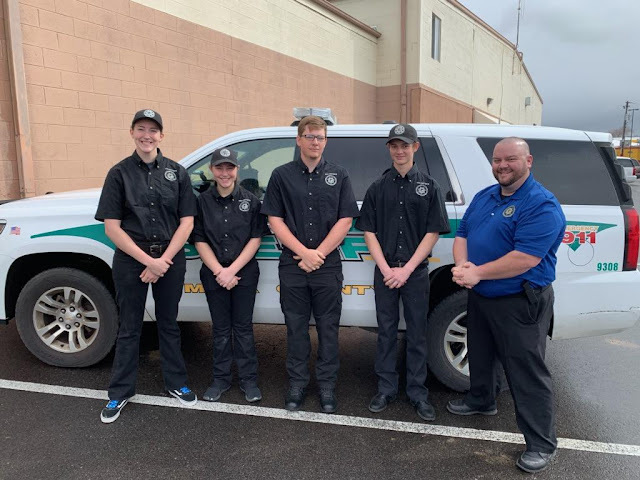 MCSO Deputy Darin Huisjen stands alongside members of the Explorer Post #321, and they are recruiting new members ages 14-20. 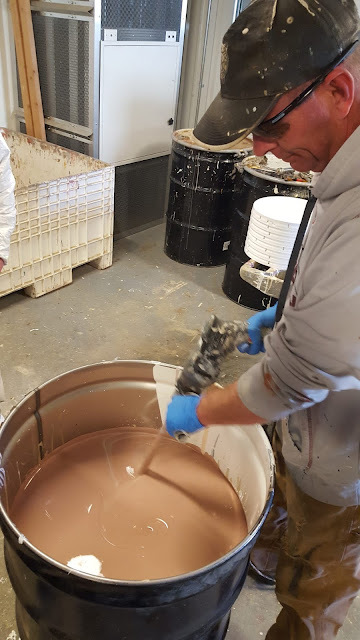 The program provides an opportunity to learn valuable skills and interact with the criminal justice community to gain a realistic picture of what a career in law enforcement entails. It is the end of the month, and if you are renewing your license plates you can use the renewal only line, no check-in required! It is that easy. 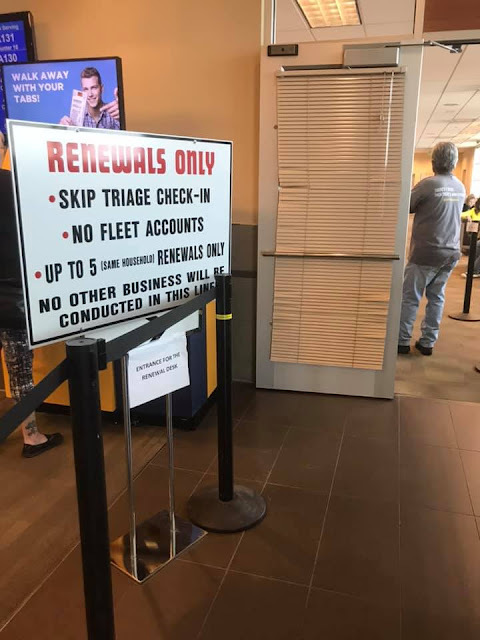 Another easy way to renew your plates is to just drop off your payment in the Clerk and Recorder's renewal drop box located in their lobby, 200 S. Spruce St. Introducing Montana Cohn! 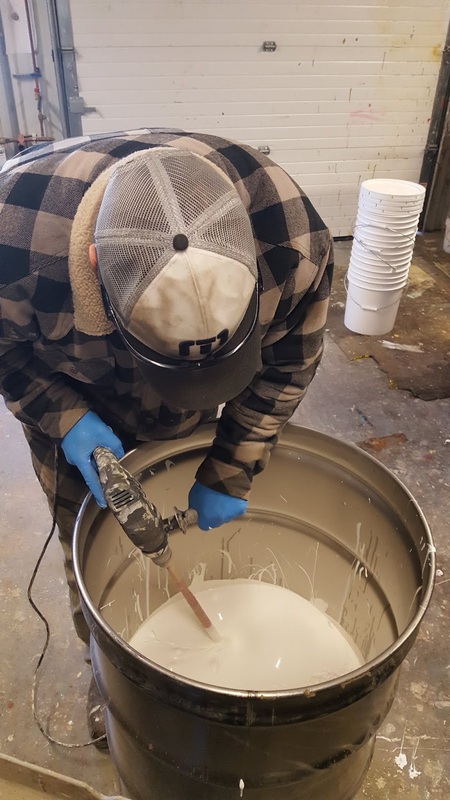 Montana is the new coordinator for Mesa County Noxious Weed Management and the Upper Grand Valley Pest Control District. 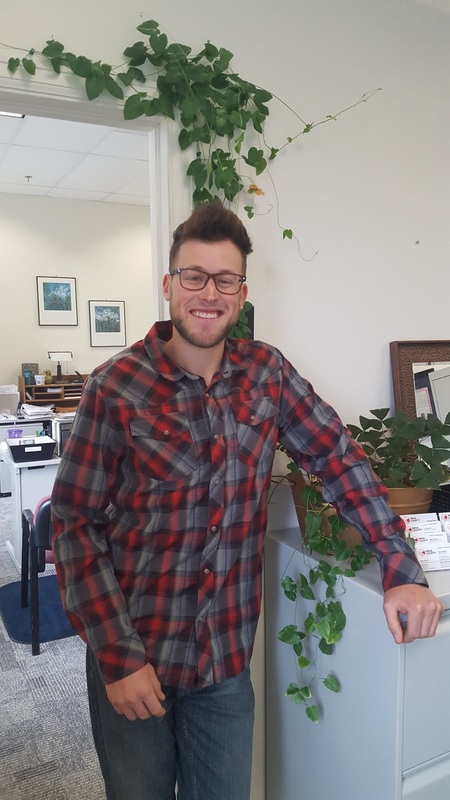 He moved to Colorado last year, has worked in natural resource programs throughout the country, had adventures around the world and is excited to take the helm of invasive species management in the county. Welcome to the team, Montana! Did you know the Mesa County Hazardous Waste Collection Facility reuses and sells 5-gallon pails of good white and tan latex paint to Mesa County residents for $20 (plus tax)? 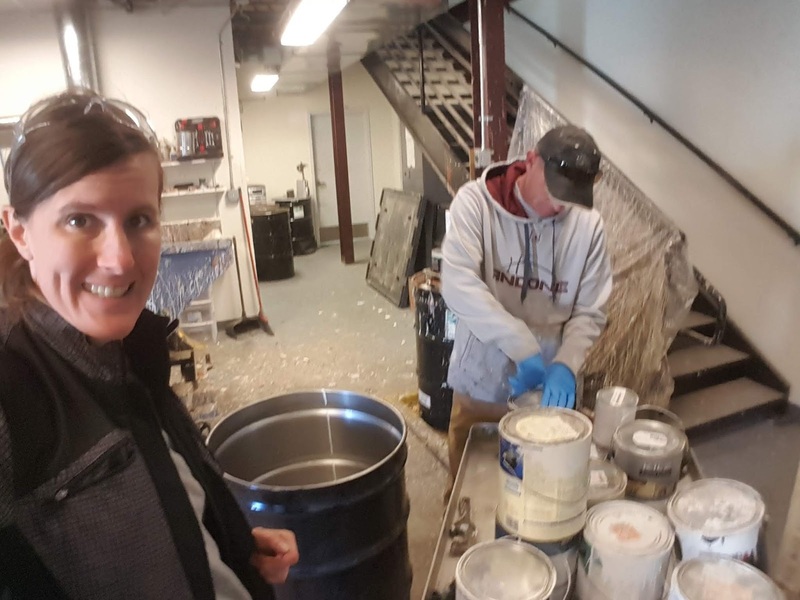 Here, Teresa Nees and Matt Younger open partial cans of white and tan paint shades to combine for resale. Shay Star with the Hazardous Waste Collection Facility uses a paddle on a power drill to stir and combine good, used, white latex paint for resale to the community. 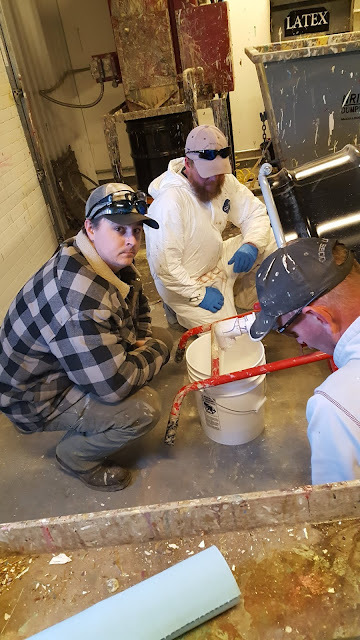 Shay Star, Jay McLarty and Matt Younger with the Hazardous Waste Collection Facility pour a fresh batch of white latex paint into 5-gallon pails for resale. Matt Younger with the Hazardous Waste Collection Facility stirs the latest shade of tan currently for sale at the facility. 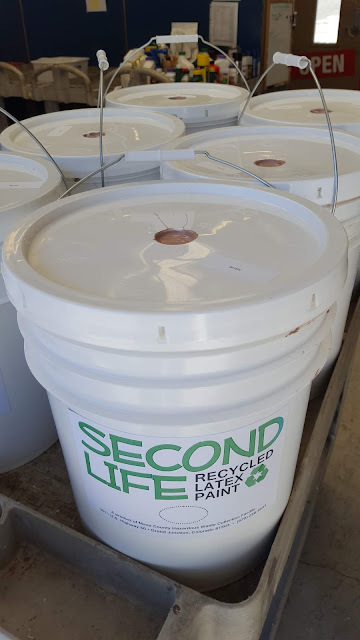 "Second Life" latex paint is for sale at the Hazardous Waste Collection Facility; 5 gallons for $20 (plus tax). Shades and availability vary. 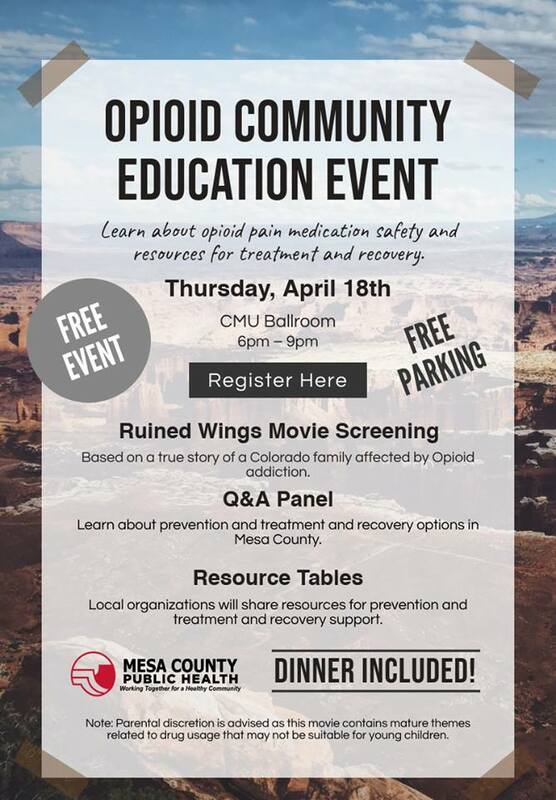 This program is just one way Mesa County practices the mission of reducing, reusing, and recycling! This morning, the Mesa County Board of Commissioners submitted a letter to the Colorado Senate in opposition to House Bill 19-1177, also known as the “Red Flag” bill. "Our Board, by Resolution, fully supports the Second Amendment of the Constitution of the United States, which states that: “A well regulated Militia, being necessary to the security of a free State, the right of the people to keep and bear Arms, shall not be infringed.” House Bill 19-1177 is disguised as an effort to get firearms out of the hands of the mentally ill; however, it does not require a person with mental health issues to seek assistance. Instead, it mandates that law enforcement take possession of their firearms, which is an undue burden and safety risk to our law enforcement professionals. While we do not disagree that there are people suffering from mental health issues, House Bill 19-1177 is not the solution needed to address these issues. 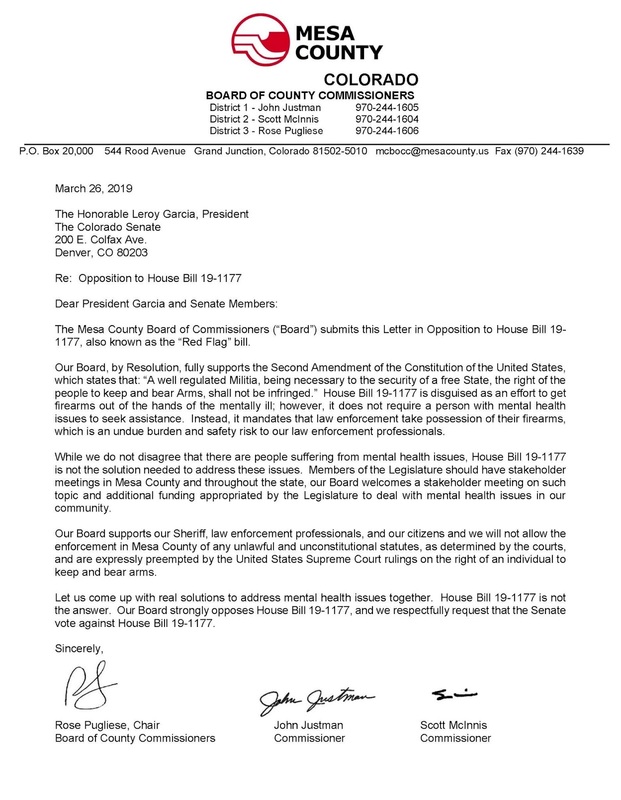 Members of the Legislature should have stakeholder meetings in Mesa County and throughout the state, our Board welcomes a stakeholder meeting on such topic and additional funding appropriated by the Legislature to deal with mental health issues in our community. Our Board supports our Sheriff, law enforcement professionals, and our citizens and we will not allow the enforcement in Mesa County of any unlawful and unconstitutional statutes, as determined by the courts, and are expressly preempted by the United States Supreme Court rulings on the right of an individual to keep and bear arms. Let us come up with real solutions to address mental health issues together. House Bill 19-1177 is not the answer. Our Board strongly opposes House Bill 19-1177, and we respectfully request that the Senate vote against House Bill 19-1177." Mesa County Administrator Frank Whidden presented the State of the County report to the Mesa County Commissioners on Monday, March 25 during the Commissioner's administrative public hearing. The latest economic indicators presented in the address show an improvement in the local economy. Mesa County government continues to provide needed services to residents while improving efficiencies in service delivery. "Our local economy is showing signs of improvement. There is an increase in building permits and sales tax and a decrease in foreclosure filings," said Whidden. "However, the decisions being made at the Colorado State Legislature, this legislative session, will have negative impacts on our economic recovery, particularly Senate Bill 181, which deals with oil and gas operations, and Senate Bill 188, the Family Medical Leave Insurance Program." "We have to plan for the future and monitor our revenue closely to ensure that in the prosperous years we plan for the lean years," added Whidden. "We will proceed with caution and make sure that the changes in revenue are sustainable as we move forward to the next year."